WHAT IF YOU had to read about your friends and family in the newspaper? News is available at the click of a button nowadays, but during the war there was only one main source of information to turn to, the newspaper. Friends and family of those serving overseas, relied on the newspaper to keep them up to date with events. But the information the newspaper had was often days or weeks behind. Newspapers were also restricted in what they could say for fear of revealing too much to the enemy. Delays and disorganisation were common during the war and technology was nothing like we are used to now. People read the paper every morning, scanning for news of their family and friends, never really knowing what was happening or what they were going through. It would have been a horrible shock for the friends and family of Henry Stratford to read the The Evening Post and learn that Henry had been admitted to hospital with an injury ten days before it was even printed in the paper, but that was how communication worked during the time. Sometimes the news was even worse. Henry returned home, but his friends may not have known until his ship's arrival was reported in the local newspaper. You have been given the newspaper from August 17th, 1915, where information about Henry (and other soldiers) is announced. You are now tasked with discovering more of the story behind Henry Edmund Stratford. How much of his story can you piece together? The suggestions below will help you on your research journey. The How We Find It Fact Sheet will also be a helpful tool in helping you discover the pieces of Henry's puzzle. You're in luck. 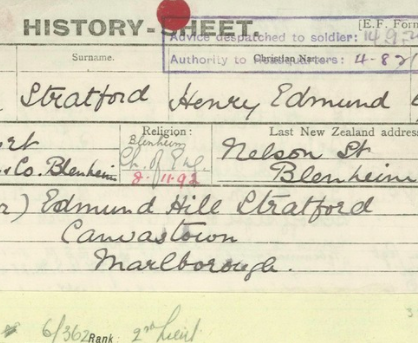 Henry served in the New Zealand Army so his records can be found online at the Auckland War Memorial Museum Cenotaph. This is your most important search. Collect as much information as you can. Once you've found Henry's Serial Number move to Archway and search for his service documents there. We first discovered this family when we saw the Canvastown School Roll of Honour. H Stratford, Hbt Stratford, Horce Stratford and H. A Stratford. We could already see from Henry's History Sheet that he had listed Edmund Hill Stratford as his father and next of kin. Use Cenotaph to see if you can discover the full names of Henry's other brothers. Use their father's name to check that they are all Stratfords from the same family. Is the Canvastown Roll of Honour missing any Stratford names? HOW DID canvastown school support the war effort? All schools studied the newspaper daily for news form the front of former pupils. In August 1916 the pupils of Canvastown School were busy organising and rehearsing for a fundraising concert. Use Papers Past and search for the exact phrase of 'Canvastown School' to find the newspaper report 'For the Belgian Children' on how the evening went. Use NZ History and search for 'Belgian Relief' to understand why this was such a popular fundraising focus for schools. How much does the article say was raised? Use the Reserve Bank Inflation Calculator to convert this 1916 amount into 2018 New Zealand Dollars. Discover more pieces of Henry's story. why did people move to canvastown? Canvastown was created almost overnight when thousands of men came to the area in 1864 in search of just one thing. Use Statistics NZ Population information to find out how many people live in Canvastown today. What was the attraction of Canvastown in 1864? Use Digital NZ to find photos of Canvastown from the turn of the Century. Papers Past is a great place to give us clues about families. We can tell from looking at the Canvastown Roll of Honour that at least 4 Stratford children who served in the First World War attended Canvastown School. Use Papers Past to search for times where the word 'Stratford' and 'Canvastown' appear in the same article. Find the article "The Late Mrs Stratford". How many children does it say Mrs Stratford had? Create a family tree of Henry's brothers, sisters and parents. did the parents of the stratford brothers have to read of their sons deaths in the newspaper? How would parents have felt sending even one son to the other side of the world to fight in the First World War? What happened to Henry, Herbert, Alphonse, Lancelot and Horace? Did they survive the war? Use Cenotaph to discover their fates. Lancelot appears to be missing from the Cnavastown School Roll of Honour and an HS Stratford is included on the Marlborough Boys High School Roll of Honour - also part of this WW100 Discovery Kit. Is anyone missing here? What could be the reasons that people's names were missed off Rolls of Honour such as these? 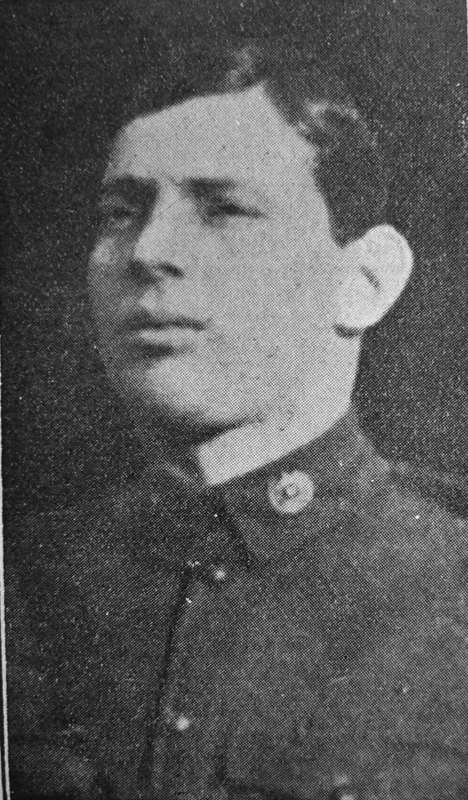 Roll of Honour 17 Aug 1915 is connected with the story of Henry Edmund Stratford who attended Canvastown School. The original newspaper is held by Papers Past: National Library of New Zealand # EP19150807.2.114. It is this project's understanding that Henry has no surviving relatives. The Walking with an Anzac Team found the first clue in Henry's story when they visited Canvastown School. This Roll of Honour takes pride of place in the community hall and is surrounded by photos and memories from the district. Further research on the same platforms you have used today allowed us to discover Herny's Story. newspaper heading for the roll of honour.